Did you already know that having a pet not only makes you happier, but makes you live longer as well? Alongside the fact that it is very pleasant to take care of your pet, it also leads to positive effects on your mental and physical health. A pet requires attention and care on a regular basis, which in turn leads to a more active pet owner. As a dog owner for example, you should walk your dog at least three times a day. Because your dog will not do this by itself, you as a pet owner will have the obligation to get out of the house and take a stroll. Your own personal trainer wagging its tail, isn’t that convenient? An increase of exercise leads to a lowered risk of excess weight and improves the condition of heart and blood vessels. This is a win-win situation for both pet and pet owner! A pet brings in a cosy atmosphere inside the house and also takes care of more social contacts outside of the house. Dog owners that go for a walk with their dog, will make new contacts more easily than people without a dog. A dog is also an approachable conversation topic, which makes it easier to start a conversation with someone. This is also true for elderly people, who make quicker contacts with local residents or other pet owners that walk their dog in the park. A pleasant conversation is good for everyone. By stroking and hugging your pet your body releases a peptide hormone called Oxycontin. This Oxycontin reduces stress and has a calming and blissful effect on the body. Furthermore, it provides a strengthening bond with your beloved pet. As Oxycontin takes care of lowering blood pressure and heart rate, this in turn also has a positive effect on heart and blood vessels. Generally speaking, people that own a pet feel less anxious and scared, less lonely and less depressed; taking care of a pet gives you fulfilment and makes you more self-assured. Chronically ill people feel dejected less frequently when having a cosy pet around them. A pet also brings a structure to your day to day life. Additionally a pet makes you laugh – because there is nothing that is funnier than seeing your dog have its ‘three minutes of craziness’ or seeing your cat falling in love with the heater during cold day. Dogs, cats, rabbits and rodents are not being called companion animals for no reason. Most of these animals are more than happy to be in your company. They enjoy being close to you and love to cuddle and play. They offer unconditional love, never judge you, offer affection and are extremely loyal. Besides this, they are always happy and enthusiastic, because who are the ones that always greet you cheerfully when you arrive home? That is right, in many cases this will be your pet jumping up and down behind the door when it hears the key going into the lock. Dogs have a sixth sense when it comes to feeling when you are saddened or upset. When they know this is the case, they will offer you comfort. Taking care of a pet can bring a lot of satisfaction to your life and for some people, taking care of their pet is their life purpose. 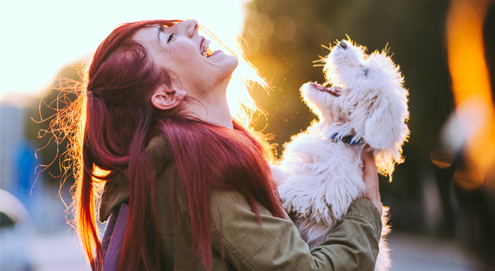 Alongside the above advantages of having a more active lifestyle that pets bring along, having a pet also has other positive effects on your physical health. Childs who grow up in a surrounding that includes dogs and cats seem to be less sensitive for developing asthma and other allergies. Having a pet can also help children that have ADHD or autism. They can benefit from the interaction with animals and personal care that comes with having a pet. It provides calmness and structure and thanks to the personal relationship a child also can become more self-assured. Furthermore it can help to overcome certain barriers and take responsibility for certain tasks. Not only children, but also elderly people can take advantage of having a pet. They will be independent for a longer period of time when owning a pet, this in turn is good for their general health. By going out of the house more and having more exercise, owning a pet also has a positive effect on your health. Pet owners more often than not have a lower cholesterol. All these factors contribute to a lowering risk of cardiovascular decease. As said before, dogs have a sixth sense. This can be very helpful for people with diabetes or epilepsy, because dogs can feel a change in blood sugar levels. Not every patient with diabetes can feel an alleged ‘hypo’ (low level of blood sugar). A dog is able to warn its owner when the blood sugar reaches dangerous low values and can tell the owner when to take action to solve the problem. Furthermore dogs are able to warn people in the area when someone has an epileptic seizure outside of public sight. They also have the ability to warn its owner before a seizure takes place, this way enabling the dog owner to secure him or herself. Obviously, these dogs are very valuable and it requires a lot of training and repetition to educate a guide dog. Swedish research recently showed that people with dogs have a longer life than people without dogs. This is mainly thanks to the lowered risks of cardiovascular disease, which is number 1 of deaths caused in Western countries. The lowered risks of cardiovascular disease can be explained by the reasons given above. In short; a companion animal is not only really cosy to have, it also takes care of a healthier and happier life. Reason enough, therefore, to spoil your lovely pet friend! You can do this on Valentine's Day or any other day you feel like giving your pet a little extra, such as Beeztees Love at first bite - dog bowl or Trixie Soft Heart Treats. You can also have a look at the other products on the right side of this article! Lovely heart-shaped treat tin with tasty snacks for your cat. Soft snacks with lamb filling for your dog. Delicious yoghurt snacks in a nice storage tin. Fun storage tin with dog treats. Complete dry food for smaller dogs. Playful dog bed with a reinforced edge. Easily removes dirt and hair from your horse's coat. With Madnip that is even more powerful than catnip . Sturdy stainless steel dog bowl. Which rodent is right for me?